In 2006 a group of good old Casper boys wanted to have a great Steakhouse and well stocked bar to come in to and shake off the dust after a long day. 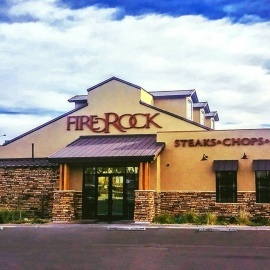 They wanted a top quality experience with great food, good drinks and attentive friendly service so they built this beautiful restaurant known as The FireRock Steakhouse. 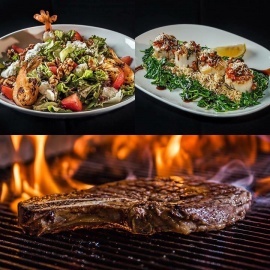 You can enjoy a "high on the hog" style atmosphere with our USDA Angus Beef Steaks, seafood specialties, entrée salads, fresh ground burgers, pasta dishes, BBQ ribs and more. Include a full bar with an extensive wine list and you've got a great time without selling the ranch to pay for it all. 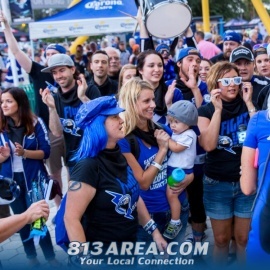 No need for reservations or to put on your "Sunday-go-to-meetin" clothes. Just come as you are and we'll do the rest. We use only USDA Angus Beef. Our steaks are hand cut, aged a minimum of 28 days and cooked to perfection over almond and oak on a wood fired grill. Enjoy! !